At ForkliftCertification.com, we’re serious about forklift safety. We believe the best way to help reduce workplace accidents and keep everyone at your workplace safe is offer the best forklift safety training and educational resources. Since 2002, we have been the most trusted online resource for OSHA forklift safety certification and training. Whether you are a forklift operator or an employer who hires forklift operators for your workplace, we’re here to offer you the highest caliber of training and certification available, in addition to the top forklift safety tips workplace. Does this look like something you’ve read recently? Yes, and no. If anything, the actual number of forklift fatalities today is more in the region of 85 per year, or 25 percent higher. These figures were lifted from an article in the American Journal of Industrial Medicine published in 1999, the year OSHA mandated forklift training and certification. It describes forklift safety statistics gathered between January 1, 1980, and December 31, 1994. In response to these deadly accidents, OSHA (Occupational Safety and Health Administration) established a series of laws and certification requirements in 1999 for anyone operating powered industrial trucks in order to reduce accidents and fatalities. 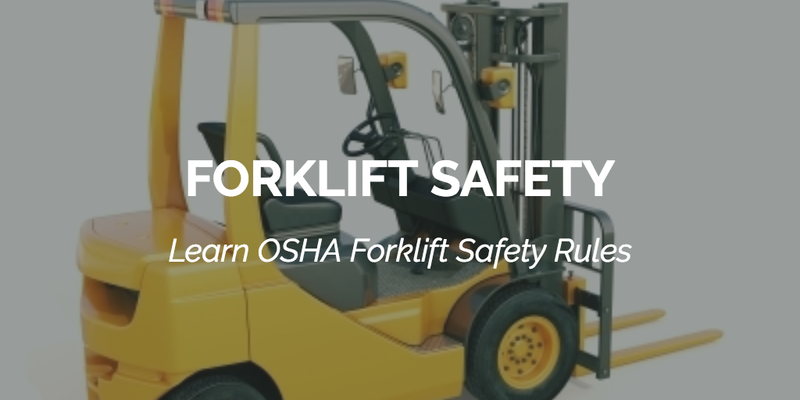 These OSHA forklift safety regulations cover operating a forklift and the training required for all operators. According to OSHA, training must be well-rounded and consist of written instruction, practical training, and a skills evaluation to ensure workers are competent at operating forklifts safely. Training must also teach both truck-related and workplace-related topics to cover all the basics of forklift safety. Training is followed by an in-person test that demonstrates the worker’s abilities to actually drive and control a forklift in various situations. In order to comply with these OSHA forklift safety rules, you must look for a training course that says “OSHA-compliant.” With ForkliftCertification.com, you’ll find just that. The operator’s demonstrated ability to safely operate a PIT. The new rules also mandated refresher training under certain circumstances; specifically, if an operator had been involved in an accident or a near-miss involving a forklift, if he or she had been seen operating a forklift in an unsafe manner, if the operator was assigned to operate a different type of PIT, if there were changes in the workplace that affected forklift safety, or if during an evaluation they were deemed to require refresher training. At the very least, forklift drivers are required to undergo refresher training every three years. OSHA forklift safety guidelines stress that it is the employer’s responsibility to ensure that each employee, temporary or permanent, who uses a forklift receives OSHA training. Said training should consist of formal classroom-style instruction, practical training and evaluation of the employee’s performance in the workplace. OSHA is empowered to levy stiff fines, running into tens or even hundreds of thousands of dollars, if they discover an untrained and uncertified forklift operator on your premises. The OSHA forklift safety training standard mandates more than three dozen points of information for inclusion in training programs. Among these are the similarities and differences between forklifts and conventional vehicles such as the automobile; the operating environment and its influence on PIT operation; types of motive power and their characteristics; and the significance of nameplate data affixed to the truck (warnings, instructions and rated capacity). The forklift safety test is the final component of forklift training that must be passed for operators to receive their certificate. There is a written test to quiz workers on their knowledge, and an in-person evaluation to test operating skills. To fulfill forklift safety regulations, the written test and evaluation must be passed, which should cover hazard identification, operational procedures, maintenance and repair procedures, reporting, and more. • Maintain a well-lit working area. Many accidents are the result of poor lighting and less than average visibility. Replace bulbs on a regular basis, and make sure those high-traffic areas have plenty of clear light. This is especially true for outdoor areas. • Make sure forklift safety features are in working order. This includes the horn, turn signals, protective cage and more. Just by checking a forklift’s safety equipment, you’ll avoid many unnecessary hazards. • Never travel with elevated cargo. This is one of the most important aspects of forklift safety training and is a leading cause of industrial accidents. Elevated cargo causes tip-overs, unbalanced traction, limited visibility and other safety risks. • Proceed with caution along inclines, near corners and adjacent to loading trucks. One of the most useful forklift safety tips involves common sense forklift operation around certain hazard areas. Loading docks, non-linear routes, and areas with pedestrian traffic require safe speeds, extra caution, and a solid knowledge of OSHA forklift safety procedures. • Never exceed the lifting capacity. One of the number one rules of forklift safety is ensuring your load does not surpass the manufacturer’s instructions for the weight capacity. • Wear proper clothing. If you’re working outdoors, be prepared for rain & snow. For indoor workplaces, stay comfortable – clothing distractions and discomfort is the last thing a forklift driver needs to deal with. • Inspect your forklift. Do a thorough inspection of the tires, gears, forks, controls. Regular maintenance not only makes sense from a safety standpoint, but it’ll also help your forklifts run longer. • Avoid distractions. Don’t smoke or use your cell phone while operating a forklift. Countless accidents have happened because of distracted drivers. • Never leave a forklift unattended while operating. Leaving the keys in an unattended forklift, or leaving the ignition on, is actually illegal and a serious forklift safety hazard. • When in doubt, use a spotter. If your line of vision is blocked in any way, a spotter can help out in a pinch. If you’re moving a heavy load in reverse and it’s a tight area, a spotter will help avoid serious accidents. • Obey speed limits, especially around corners and turns. Tip-overs and unbalanced loads can cause hazards that can become serious accidents. • Clean up spills immediately. A major problem in warehouses and other areas with liquid merchandise is slick spots from dropped pallets. If these are not addressed right away, workers (on foot or on forklifts) are more likely to fall and suffer serious injuries. • Understand proper refueling or battery re-charging practices. A forklift should be refueled only after it’s been turned off and parked in a designated area. • Report any and all accidents and injuries. Even “minor” mishaps should be brought to your supervisor’s attention. A running record of incidents helps compile information on what happened – and more importantly, how to improve on forklift safety conditions. • Understand proper stacking practices. Knowing the correct height and weight limitations for stacking pallets on forklifts, and the proper loading and unloading practices will help to prevent many accidents that are caused by improper stacking and load handling. • Get trained. Just like everything else, a properly trained forklift operator is a better forklift operator. There is no substitute for good forklift training and instruction. Our Bundle Package, Training Kit and Train a Trainer courses are superior to other forklift safety training courses. We ensure your training is up-to-date with the most recent forklift safety tips and OSHA forklift safety guidelines. Why is Forklift Safety Important? Accidents, injuries, and other on-the-job mishaps will be investigated by OSHA. If you or your company are found to have operated forklifts or other powered industrial trucks without proper training, heavy fines and other financial penalties are very likely. Plus, the negative PR that could result from a lengthy investigation can do severe damage to both personal and professional reputations. OSHA forklift safety guidelines and regulations are in place for a reason. That’s why it’s so important to follow the forklift safety tips (and other reference materials) outlined in this article. We take OSHA forklift safety rules seriously. Understanding forklift safety regulations is key if you want to create an accident-free workplace. If you’d like to experience the FLC difference, our contact page has different ways to reach us. Or, just dial (888) 278-8896 and speak with our friendly customer service team. To help you keep you, your employees and your coworkers safe, we offer operator training kits, train the trainer programs, and bundle and save kits to use onsite at your workplace. Additionally, we provide resources and forklift safety tips through our forklift safety blog, to share with you even more ways to stay safe at work. If you’d like to have your own in-house instructors to lead the forklift training for new employees, the Train the Trainer course is for you. This one-time course fee is the most efficient way to train aspiring operators and ensure your workplace is always compliant. This course teaches Warehouse Forklifts (Classes 1, 4, 5), Pallet Jacks & Order Pickers (Classes 2, 3), and Rough Terrain Forklifts (Class 7). It also includes free three-year renewals for life, and all handouts and checklists for the forklift safety test. Save money by combining the Training Kit and Train the Trainer class with the Bundled Package. This package deal contains everything you need to get started right away training new employees with your own in-house instructors. All of our courses have Spanish and English options, and can be taken online from anywhere, as long as you have the internet. Thanks again for making FLC the best place to receive quality, complete OSHA forklift safety training. With our courses, your business will be experts in all of the most important forklift safety tips workplace.